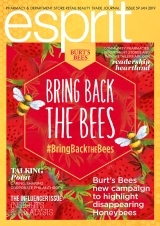 esprit has a total focus on subjects and information that appeal to its readership who work in the retail beauty industry. Every issue is devoted to profiles of local and international industry heavyweights, what’s trending now, marketing moves, issues affecting the industry, staff training and strategies, brand profiles and the latest industry news, views and launches. esprit is published quarterly and its value and reputation in helping the beauty industry keep up-to-date with relevant and trustworthy information, and increase the ability to make money, is unsurpassed.